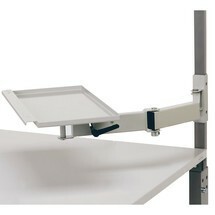 The corner attachment table is part of an ergonomic workstation system. 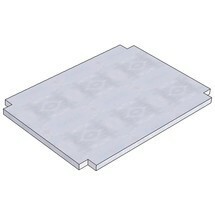 You can use this to expand your worktable at a right angle to create another work surface. The height-adjustable legs enable the table to be moved to your working height. 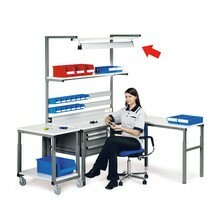 This workbench on castors is part of a practical modular system and can be used in almost all areas. 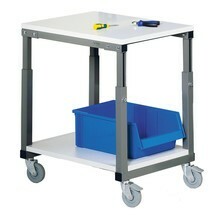 The legs on the table trolley are height-adjustable so it can be adapted to different working conditions. 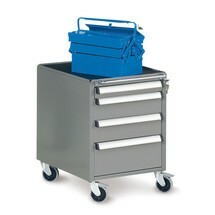 The lower worktop for the SAP table trolley expands the storage space in the lower trolley area. It can be retrofitted and carries objects and materials up to a total weight of 40 kg. The workstation light is suitable for retrofitting to existing workstation systems. The adjustable light angle allows you to regulate the incidence of light individually. The mobile storage unit is made from robust steel plate and is ideally suited for industry and workshop requirements. The steering castors on the front are equipped with easy-to-reach wheel stops. 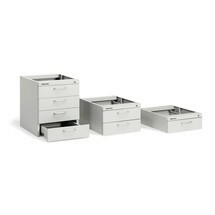 With an under-bench drawer unit, your tools, documents and other materials are always close at hand at your workstation. 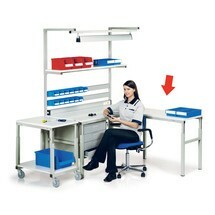 Simply place the unit under your workbench or desk. This adjustable attachment table with a load capacity of 150 kg can be flexibly used to expand existing bench systems. If necessary, adjust the height so that it is suitable for either sitting or standing activities. The suspension rails for open-fronted storage bins for workbenches are used for the space-saving suspension of small parts boxes. You can easily attach a rail like this above the bench top at a right angle in order to be able to quickly access your boxes. The additional rail for TPH workbenches is a component which you can use to attach an add-on attachment. This will enable you to grip the attached work aids quickly and accurately. This swivel arm for workbenches can be used to hold items such as monitors, printers or work materials, thus freeing up space on the bench top. The swivel arm can be positioned at the desired height and individually adjusted.